Woodland Strawberry (Fragaria vesca) - Clears negative thinking, worry and anxiety. Creates a sense of ease by separating thoughts from feelings so they can pass through your mind freely without turning into sticky emotions. Facilitates thinking clearly and feeling authentically. I AM clear, free-flowing thoughts and authentic feelings. Woodland Strawberry is a US Pacific Northwest native groundcover that has tiny white 5-petaled rose-like flowers. The tiny strawberries are a bit mealy yet tasty and are a favorite of birds and other small critters. They don't leave many for us humans to eat. North American indigenous peoples made a strong tea of strawberry leaves or roots for eczema, blood purifying and building, intestinal or urinary issues, night sweats, and strengthening the gums. Stuck in an emotionally charged mental tape loop unable to separate thoughts from feelings. Patterns of anxiety and worry. May lead to jumbled thinking during the day and disrupted sleep patterns at night. Woodland Strawberry flower essence helps you to separate your thoughts and feelings, which stops the emotionally charged tape loop. 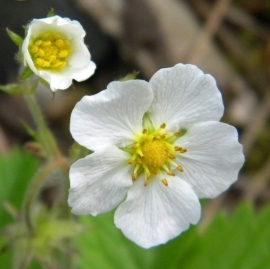 By establishing multi-directional channels of communication between mental and emotional functions, Woodland Strawberry Flower Essence pulses the emotional center at the heart chakra to operate independently from the cognitive and emotional brain functions. It also clears static from the channels of communication between your personal mental and emotional energy fields. This supports thinking clearly and feeling authentically. While this essence was being made, a matrix of amber, clear and green apophyllite, charoite, lepidolite, white and red stilbite and drusy quartz crystals was placed among the mother (storage) bottles and plants. The sun acts as a transformer to step down spiritual energies from higher dimensions. While the essence was being made, Amber acted as a lens to receive and focus sunlight for this purpose. Clear with green apophylite activates the heart chakra, assists you to absorb energy from the Universal Source, provides powerful loving energy in creative and intuitive endeavors and grounds these into physical action. Charoite assists with integrating heart chakra and higher mental energies while transmuting what we perceive as lower negative energy. Red and white stilbite has a healing effect on the mind and energy fields. It supports you when you feel overwhelmed or uncentered by too many daily tasks, or unclear about how to integrate the rapid change on your spiritual path. Lepidolite is a calming stone that helps you have a strong emotional center and be unaffected by the dramas and happenings of your external experience. It encourages you to see beauty and know that suffering comes with resisting, instead of allowing, feelings and experiences. Drusy quartz crystals help to energize and stabilize your subtle bodies. The actions of the crystals inform the way this flower essence seats into the body/mind.